The design of these gloves makes them cheap and relatively safe. Layer up cotton-plastic-cotton gloves to create a barrier between your skin and the flaming lighter fluid. Use these fireproof gloves for movie SFX or a magic show. Or just to add some flair to your raver-style hand dancing. Like all truly fun pyrotechnics, follow directions diligently...or find yourself singed and sad in the ER. If you flipped someone thi bird, man... that would almost be the ultimate '#$%@ you', ya know? 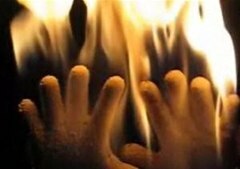 i tried it and it worked great for my hands but be careful because if you hold your hands down the flames will go up your arm. I burned all the hair off both my arms!